Ana Capetillo and Fanyong Du starred in the matinee presentation of Mannes Opera's production of Gaetano Donizetti’s L’Elisir D’Amore. 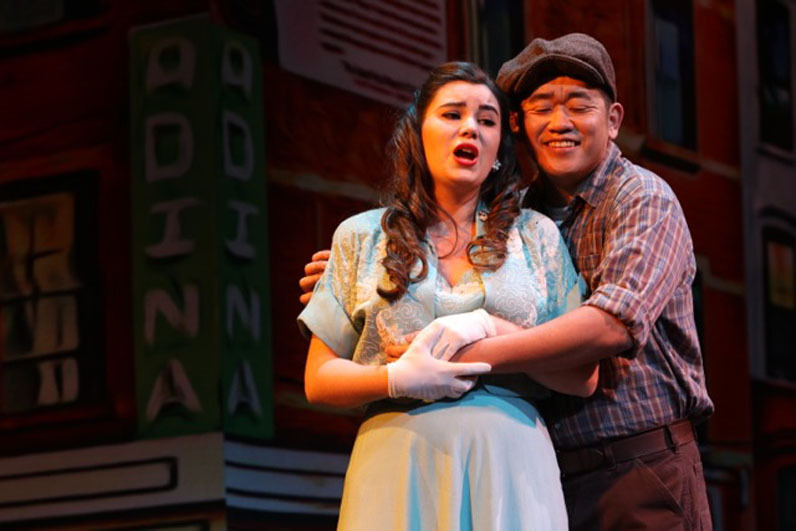 In the first act of The Mannes Opera’s production of Gaetano Donizetti’s L’Elisir d’Amore (The Elixir of Love), Nemorino, a down-on-his-luck villager played by Fanyong Du (PDPL Voice), tries and fails to wins the affections of Adina, a wealthy landowner played by Ana Capetillo (BA Voice). Tormented by her indifference, Nemorino sings sorrowfully, “Quanto è bella, quanto è cara” (How beautiful she is). However, by the second act, Nemorino starts to perk up. In a desperate attempt to capture Adina’s heart, Nemorino drinks a “love potion” (actually a bottle of cheap Bordeaux wine) sold to him by a swindling salesman–doctor. To Nemorino’s delight, the potion appears to work: He becomes popular with the ladies (although not for the reason he believes), making Adina jealous. It was at this point, during Du’s performance of the famed aria “Una furtiva lagrima” (A furtive tear), that the sorrow in his voice was transformed into pure joy: His long, sweeping passages radiated throughout the theater, giving way to a resounding ovation. The aria was one of many breathtaking moments in The Mannes Opera’s matinee performance of L’Elisir d’Amore, Donizetti’s romantic comedy of rural life, which shone brilliantly on the stage of the Gerald W. Lynch Theatre. The performance, which was preceded by a fully staged production the previous night, was the culmination of a year’s worth of hard work and dedication on the part of Voice and Orchestra students, led by artistic director Joseph Colaneri. The opera centers on Nemorino and his pursuit of Adina, who, in the opening scenes, reads aloud to the townspeople the romantic medieval legend of a warrior who wins the heart of a princess by drinking a magic love potion. As she completes the story, a regiment of soldiers appears, led by the egomaniacal Sergeant Belcore (Jose Cuartas, MA Voice), who immediately introduces himself to Adina and asks her to marry him. Nemorino, distraught by this turn of events, confronts Adina, who spurns his advances. Desperate to win Adina’s love, Nemorino turns to Dulcamara (Edward Cleary, PDPL Voice), a traveling purveyor of elixirs, who sells the protagonist a bottle of his famed love potion. Instructed by Dulcamara to wait 24 hours for the potion to take effect (just enough time for him to skip town before his customers become wise to his scam), Nemorino drinks and waits for it to kick in. He begins to feel the “effect” of the potion and, convinced he will be irresistible to Adina the following day, feigns cheerful indifference towards her. However, when orders arrive for Belcore and his soldiers to return immediately to his garrison, Adina agrees to marry the sergeant at once. The shocked Nemorino begs her to wait one more day, but she dismisses him and invites the entire village to her wedding. The solution to Nemorino’s crisis? More potion! For the production, set in Little Italy in the 1950s, designer Roger Hanna created a dreamy, whimsical streetscape that served as the ideal backdrop for the action of the opera. L’Elisir d’Amore was directed by Laura Alley, with costume designs by Helen E. Rodgers, lighting design by Jeff Davis, and makeup and wig design by Amanda Miller. Members of The Mannes Orchestra offered a stirring accompaniment to the performance. The production of L’Elisir d’Amore offered the students of The Mannes Opera the opportunity to test their vocal abilities in a live setting while gaining the experience needed to stage a live production. For more information, visit newschool.edu/performing-arts.